California’s minimum wage workers will receive a 62.5 percent raise over three years if Senate Bill 3 is approved by the Legislature and signed by Gov. Jerry Brown. The Senate Labor and Industrial Relations Committee recently passed the bill on a 4-1 party line vote. It was only a year and a half ago that Assembly Bill 10 was signed into law. It raised California’s minimum wage from $8 an hour to $9 in July 2014 with another increase to $10 scheduled to take effect in January 2016. SB3 would supersede that bill, increasing the minimum wage from the current $9 to $11 in January 2016 with another $2 bump to $13 in July 2017. Thereafter the minimum wage would increase with inflation. The bill’s author, Sen. Mark Leno, D-San Francisco, and its supporters spent more than an hour telling the committee that the wage hike is needed to lift California’s minimum wage workers out of poverty. They assured that doing so would not hurt businesses and would benefit California’s economy and the state budget. “Wages are growing at the very slowest rate relative to corporate profits in the history of our country,” said Leno. “The median wage has been stagnant over the last 30 years. Sixty-five percent of workers are working paycheck to paycheck. Millions of Californians impacted by our minimum wage are living in poverty, and will continue to live in poverty even when we get to our incremental success under AB10 to $10 an hour next year. A $13 minimum wage equates to about $26,000 per year, he said, which is above the federal poverty level of $24,250 for a family of four. Leno argued that businesses will benefit from increased consumer spending. “When workers have more dollars in their pockets to spend on their daily needs, there’s an increase in demand for goods and services,” he said. “That’s when employers have to hire more employees to meet that demand. And that’s what economists call a virtuous upwards cycle. Higher wages will also benefit businesses by reducing turnover, attracting higher-skilled workers and increasing employee satisfaction, which leads to better customer service, said Leno. Effect on unemployment rates and income inequality? California’s experience with raising the minimum wage last July has shown that it doesn’t hurt employment, he said. The state’s unemployment rate, which was 7.4 percent in July 2014 when the minimum wage increased $1, dropped to 6.5 percent in March. 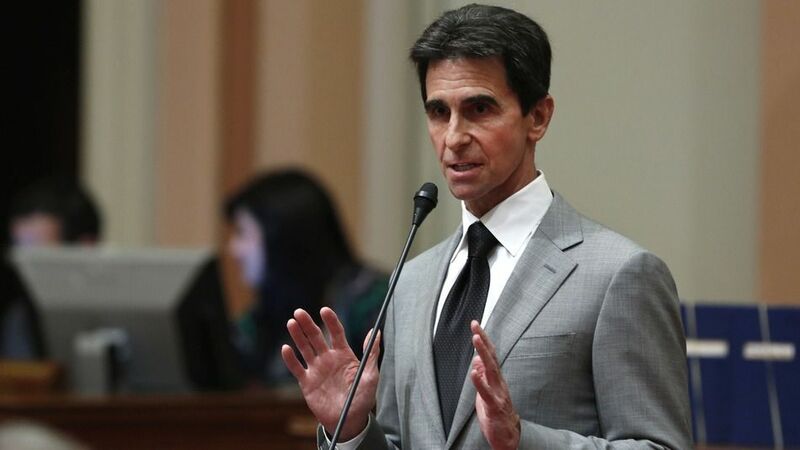 The bill’s coauthor, Sen. Connie Leyva, D-Chino, who said she has spent the last 20 years in the labor movement, said the minimum wage hike is needed to reduce income inequality. Teenagers no longer make up most of the minimum wage workforce, she said. Today 88 percent are 20 years or older and 55 percent are women. And most are part-time, averaging 28 hours a week. UC Berkeley economics professor Michael Reich told the committee that more than a third of all California workers will get a pay raise under SB3, but businesses will be able to absorb the increased labor costs. “We find that the most affected industries are going to be restaurants, hotel and retail,” he said. 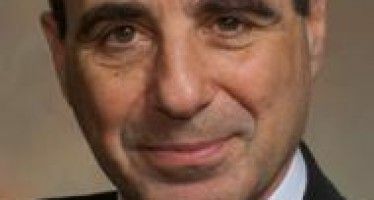 “And that businesses will mainly adjust to these increases by reducing turnover costs. Workers won’t quit as often, they’ll stay longer, they’ll be more productive. This will save employees recruitment and retention costs, which would themselves absorb the savings of about 15 percent of the increased payroll. Although higher prices tend to result in decreased spending, that will be offset by the increased dollars in workers’ wallets. 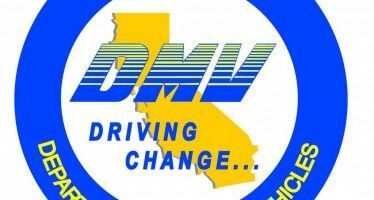 The net effect, based on preliminary calculations, is that California’s gross domestic product would increase by about one-tenth of 1 percent, said Reich. Similarly, although the state budget will take a $2 billion hit over two years due to paying higher wages for social service workers, that will be more than offset by reduced state Medi-Cal payments, he said. The health care costs for those workers would instead be borne by the federal government’s Medicaid coverage through the Affordable Care Act. And the federal costs will be offset by reduced food stamp payments. “So when you add up the increased cost of the salaries, the lower expenses for Medi-Cal and increase in income and sales tax revenue … then the state budget would realize net gains of about $2.1 billion in 2016 and 17 under SB3,” said Reich. “When I mentioned this at a private meeting with Gov. Brown he said, yeah, he’d like a free billion dollars too. 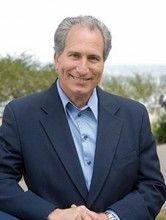 But the lone Republican on the committee, Sen. Jeff Stone, R-Temecula, does not believe it. He cited the Congressional Budget Office’s estimate that raising the federal minimum wage by nearly $3 would cost 500,000 jobs. Despite that, Stone supports raising the federal minimum wage to $10.10 because it would be applied equally throughout the country. But California’s $13 minimum wage would “further make us more business unfriendly,” he said. “We rank at the bottom of the list. According to Chief Executive’s annual report of CEOs, California is dead last. This certainly is not going to create an asset for business. Stone said that the best way to lift people out of poverty is to provide them with the education to get better jobs. “I believe that by increasing the minimum wage – and this is where we’ll just agree to disagree – is that we’re going to be hurting those that we most prolifically want to help,” he said. 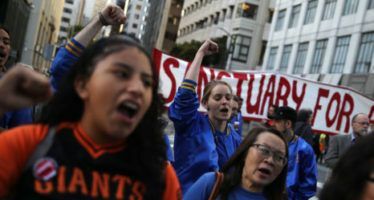 He warned that raising the minimum wage could be the straw that breaks the back of California businesses on top of expenses such as sick leave, taxes, worker’s compensation, Obamacare and unemployment insurance. “If you combine all of this and now you have this higher minimum wage, I personally believe that we are pushing the state to a threshold of a catastrophe,” Stone said. “We have governors from other states now that have already grabbed the low-hanging fruit. Those are the large businesses that are leaving; businesses like Toyota, businesses like Sherwin Williams Paints. They are taking thousands of jobs with them. And now they are coming in and going after the small business man and taking the small businesses out of state. “And with FedEx and UPS, people can ship with Amazon.com, you don’t have to have a brick-and-mortar facility to have these jobs in the state any more. And we cannot rely on the beautiful climate and the beautiful mountains and our beautiful oceans to keep people here. People have to eat, people want to have opportunities. Stone was backed by several business representatives, including Jon Ross, representing the California Restaurant Association. He said that no study has analyzed the business impact of a nearly 63 percent minimum wage hike over three years. “There is no model out there of actual experience that will tell you what the impacts will be,” said Ross. “And to us, that’s a heck of an experiment. Trying to impose that kind of a cost impact on a restaurant model where two-thirds of your costs are labor costs, to see those go up by 63 percent over that short period of time is daunting. “The assumption is that this will be borne by price increases. But our operators, especially the small ones who are local, know that they can’t raise prices at that rate that fast. Small increases over time is the way prior minimum wage increases have been dealt with. But those have been increases in the 25, 50 cent range, and the biggest one ever in 2010 going up $2 over an 18-month period. Ross said that the reason teenagers are no longer predominant in minimum wage jobs is that they have been priced out of entry level employment. Six of the top 10 areas in the country with the highest rates of teen underemployment are in California, he said. The concern about minimum wage workers living in poverty may be overstated, he said, when considering those who are receiving tips, which can raise their pay on average to $20-$25 an hour. “One of the things that’s sort of crude about the minimum wage as applied in the typical restaurant environment is that it doesn’t take account of those disparities in the house [between tipped and non-tipped employees],” he said. SB3 is scheduled to be considered by the Senate Appropriations Committee on April 20. There was a time when the minimum wage was an incentive to get an education to get into job that would pay a wage to support a family. Now, the crusade toward huge increases in the minimum wage to the point that everyone will be getting similar compensation as those on Social Security. The crusade toward entitlement lives on while the incentive to get educated loses. Numbers don’t lie but liars can figure. Yes, our employment numbers have improved, but those reporting those great numbers don’t bother highlighting that most are in the food service and hospitality sectors. 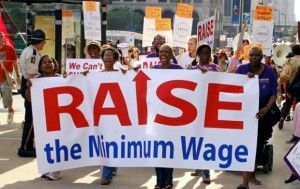 The public focus is diverted to those not making enough on minimum wages, i.e., those in the food service and hospitality sectors, and the crusade is to RAISE the minimum wage! Rather than heal the wounds resulting from constant attacks on businesses that are driving out many high wage positions and driving up the costs for those that remain in California, the easy way out is to apply a “band aid” on the wound rather than heal the wound. But wait, the unintended consequence associated with the upcoming minimum wage increases will be a great way to incentivize kids to drop out of school. 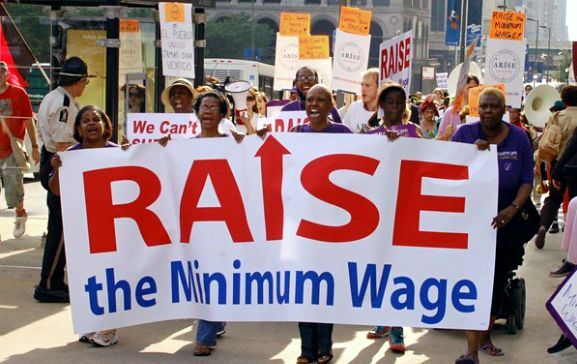 Imagine the carrot of a huge minimum wage of a $25 to 30,000 a year minimum wage as a reward for no higher education. These kids will also be netting more than those on fixed income Social Security. It may be better to stop beating up on businesses with over regulations, over taxation, and uncontrollable “fees” that are slight inconveniences to those making the big bucks, but the California financially challenged will continue to disproportionally pick up the costs “camouflaged” at businesses. The minimum wage proponents engage in static analysis. They are assuming that massive increases in minimum wage (and thus related costs such as unemployment insurance, social security and workers comp) will have little or no effect on employer hiring (and indeed LOCATING or even CONTINUING IN BUSINESS) decisions. And that the non-labor substitution effect (think “robots”) won’t be a factor. This is a test to see just how dumb most of our state legislators are. I think we know the answer already. Rock bottom minimum wages are a direct subsidy to businesses and corporations, since their employees are forced into public assistance. NO full time worker, even a burger flipper, should have to be on food stamps, etc. And for you business owners who hate paying your workers, and think human beings are lucky to be your slaves, I say SCREW YOU! I own a business and I do my utmost to find AND COMPENSATE the best people. If I treat them abusively I expect them to leave ASAP. Minimum wage work is treated by many in the cronyistic ‘business community’ as some kind of character flaw. The truth is millions are stuck in these dead-end jobs because our economy has been LOOTED by business oligarchs and their political cronies!!!! The insane taxes and regulations we all face are used as a barrier to entry to kill the american entrepreneurial spirit! There is no way you own a business as you have no clue about the most basic economics. Wages only exist to, as you say, “find and compensate the best people.” Paying over that level is a good way to become a closed business. You may not like the laws of economics, but they are laws. Learn ’em, love ’em, hate ’em, no matter. They are fixed. When politicians meddle and try to manipulate basic economics they just create massive and mostly-predictable market responses. You and your ilk are already killing thousands of coveted waiter and barrista jobs as restaurants switch to kiosks and tablets. Nice going, Sparky! Hey little Joe-remind me not to patronize your ‘business’. You probably have a headcount full of sub-minimum wage illegal aliens, ALL of which are on food stamps, medicaid, etc etc. And you pay them nothing..because you can! I’m the one who is making up the difference with my taxes. I’m all for the laws of economics reigning supreme, but real wages have been stagnant since the ’70’s while the cost of living goes up relentlessly. Much of this thanks to unregulated immigration, egged on by chamber of commerce goons like yourself. So yes, I think the gubmint is right to stick it to you and force your labor costs up. Time to pay your own way man…. What unions cannot do the political class oblidges…they are terrified….teaming millions of poor people pouring into the state…..social services and health systems broke and breaking down….envy of gov workers with nice wages and top benefits…..will not end well……particularily, economic growth kaput for owners no longer can control or improvise to save labor costs, energy costs, rents, interest, commodity costs. What fool does brick and mortar labor intensive business in the future. All those employment numbers the state puts out are fudged and fake. They do that to make themselves look good. If anyone believes these so called employment numbers, you have a major hole in your head in which I can drive my truck through. Of course they are going to say that the last minimum wage hike didn’t cause any problems with employment. Would you expect them to report anything different! To do so would destroy the socialist agenda the Democrats are pushing. Economic ignoramuses like Leno shouldn’t be allowed to even run for public office in the first place. He hasn’t a clue. Secondly, if there’s a SF after your name you’ re obviously an ultra “progressive” (should be regressive). No one is making the minimum wage dummy. When you factor in food stamps, rent support, medical, etc. and all of the other taxpayer supported welfare, it’s much, much higher. I could go on, but the stupid hurts too much. Great, informative article. It makes clear — to me, at least! — that both sides have a case.